The other day we took a day trip over to Seattle, proper. We don’t live in Seattle, proper. We live a boatride away. So we went to Seattle for the day, just exploring and checking things out. Last November I had taken the kids to Golden Gardens Park, which was quite lovely and attached to a huge beach. We loved it. Plus, it was empty, which made my levels of anxiety regarding losing a kid in a park almost nil. We all wanted to go back and play at this magical park again. Unfortunately, last time we were there was the end of Fall. Now is the end of Spring. It was packed with people, bbqs, volleyball nets and random mohawked circus jugglers. If you haven’t seen “Hot Fuzz,” then this won’t make much sense. But it is hilarious. So, we hung out at the tide pools and the kids collected a few billion caterpillars that are swarming on everything around here, and stuck them on their jeans and walked around with them. Eve named hers Nacho. Nacho the Caterpillar. After that we were driving past the Locks, and stopped in to take a peek. The Locks is this ginormous park that celebrates the Locks that separate the Washington Lake freshwater from the Sound saltwater, and allow ships and boats to go through without disturbing the water too much. It was neat. We watched a 1980s video in a dark room about it. So, we were walking around and watching people’s boats go through the Locks, and on the other side we found the Salmon Ladder. This ladder is to make sure the salmon can migrate home without getting stuck in/on/around the boats. Apparently it is pretty successful, because they built this thing in like, 1916 and it has been managing boat travel and over a million salmon, or some crazy number, every year. All this being said: we were standing in front of the fish ladder exhibit, which was rather interesting. If there were fish coming through, you would be able to watch them through the windows. However, we were past migratory season so we were just watching water. But still – pretty interesting to learn about. Well, next to the windows were little red buttons. However, no one read the plaque. Well, I did, but no one else noticed it was there. Now, it has been a rather long day at this point and we are at the end of our urban hike, so I am a little tired. This is the excuse I am using to justify my response. I don’t even know what this means. The fish will fall out of where? Onto what? Into the auditorium? Into the water? So many questions! But every one of the kids asked me the same question about the red button, and I said the exact same thing each time. Ben was far too eager to get in on this action, and we discussed the fish (who weren’t even there) for a good long time while we were at this exhibit. Needless to say, no one pushed the red button since no one wanted to hurt the fish. 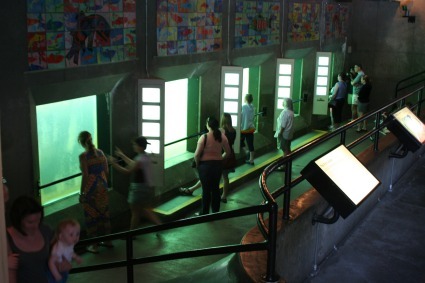 I imagine, many years from now, my children will take their children to see the Salmon Ladder.